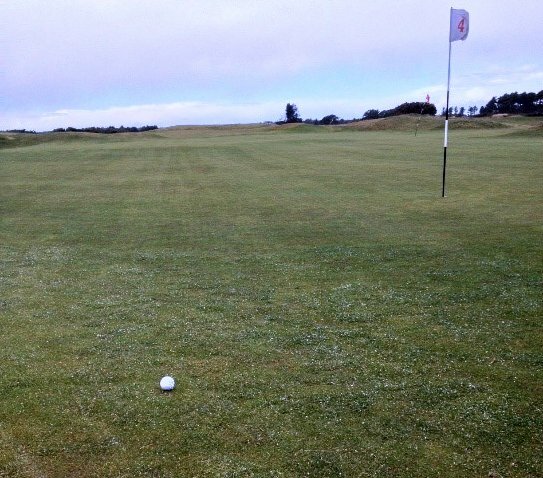 Fraserburgh Golf Club, Scotland, March 13, 2014. The non-business portion of my trip started in St. Andrews. I did some local scouting at the Keys Bar, where I ran into Dave, an American expat who has lived in St. Andrews, on and off, for twenty-seven years. He caddies during the golf season and, as far as I could tell, hangs out at the Keys in the off season. The next day, I took a train to Carnoustie, half an hour to the north. Perhaps because of the time of year, or perhaps because of the weather, I went out solo, no one in front of me or behind me. I muscled an ugly 4-iron into the wind, and then had my first go at hitting from a “winter mat.” Apparently, these are standard in Scotland. I am not a good golfer, but I can generally get the ball headed in the right direction. However, I could not master the mat. 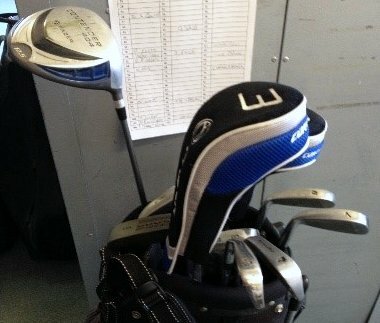 My reward for a good drive was inevitably a sculled iron. I found myself hoping I would miss the fairway, to be spared the mat, and when my ball landed close to the rough I kicked it in. It was interesting to find myself in this alternate golf reality, and I spent a good deal of time wondering what it said about me as a golfer (and as a person) that I was more comfortable playing from what most people think of a bad lie. Fourth green, Carnoustie. The white stuff on the ground (not the ball) is hail. Next, I headed north, to Fraserburgh, and, once again, went out on my own. I was the beneficiary of a new employee, who told me that mats were unnecessary, despite signs saying otherwise. The course wanders through the shoreline dunes and is truly spectacular. Fraserburgh Golf Club, thirteenth hole. To navigate among the dunes, I had to follow the signs carefully, which wasn’t always easy. If wondered if they were in Doric, a dialect spoken by folks in the area, but it turned out that they had just been beaten up by a long and windy winter. 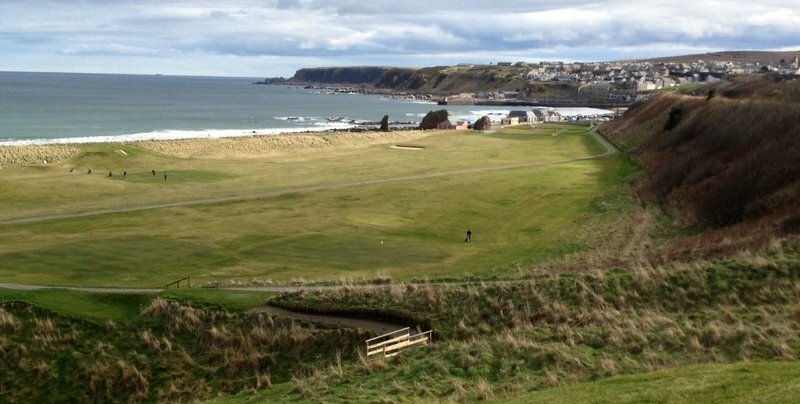 Cullen’s fairways weave across each other, and there is a complex set of bells and “yielding” protocols that the locals know. The course is complicated by a right-of-way that allows walkers to get from the ridge above the course to the beach below. All in all, it was a somewhat hectic scene, and I was happy to be joined by Graeme, a local member, who was out for a Sunday round. Like many in the area, he worked on a fishing boat before getting a job in the oil-and-gas industry. Now he is a cook on an oil rig, where he works two weeks on, two weeks off, four weeks on, four weeks off—leaving plenty of time for golf. I came away with what I hope will be a new addition to my golf lexicon: “hitting into the skink.” I am not sure what it means, but I like the way it sounds. The first hole, second tee, fifteenth green, sixteenth tee, seventeenth green, and eighteenth hole at Cullen. 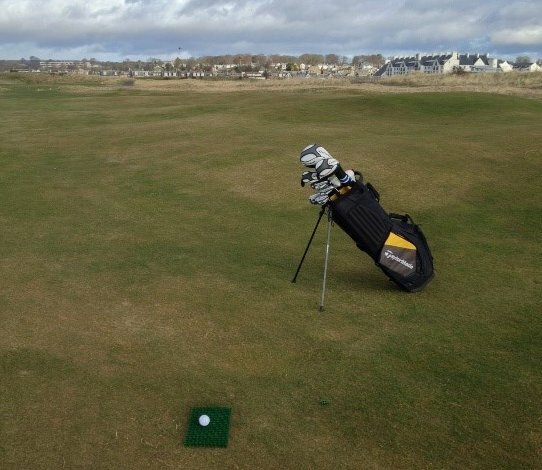 This entry was posted in Back-Roads Scotland, Equipment, Golf Courses, Scotland, Sunday Morning Group, Weather and tagged Carnoustie, Cullen, Fraserburgh by David Owen. Bookmark the permalink. Have just shared this post with a Scots friend. Will ask him for the translations. 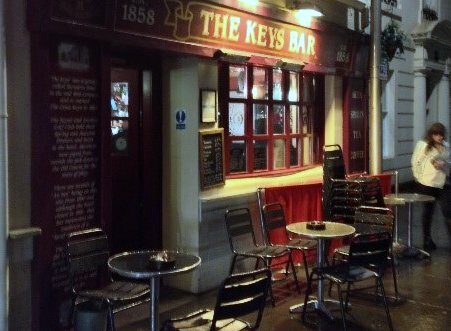 For any visitor who enjoys a wee dram, the Keys is an absolute must.Great selection and staff, especially Claire, whose knowledge and enthusiasm is second to none.